Just had to put in the puns. But first, I have to thank Miss Coco for the luscious range of nail colours. 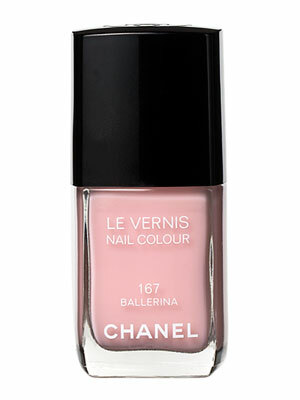 After perusing the counter for the perfect spring/summer shade, I opted for the Ballerina. I LOVE! If I can’t wear the clothes, I can at least wear the colours, right? Speaking of colours, I am completely in love with this season’s colours and textures – soft sherbert hues, whites, floaty silk tops and textured metallic pieces. I’m a little meh about Zara, spending about five minutes tops per visit. Zara Kids is a different story, but I’m normally in and out of the adult section. But this weekend, I was internally going a little gaga over the floaty, princessy pieces. I even bought an oversized hat for our holidays coming up in Mallorca. And I am not a hat person. My idea to have a lovely Easter Sunday lunch at home went out the window when Mr B suggested we have brunch at Roka. Well of course I wasn’t going to pass that up. Roka is probably one of my favourite restaurants in London. On the weekends, they serve this fantastic brunch which is basically all you can eat sashimi, sushi/nigiri, Japanese fusion salads, miso soups, noodles pickled vegetables and kimchi as well a choice of mains and a dessert platter to share. On arrival you are led to the bar where there is a Bloody Mary bar, or if you prefer something a bit sweeter, a berry Bellini or a non alcoholic cocktail. Endless glasses of white and red wine are served throughout the brunch. Whew! Getting full just writing about it. Anyway, I was having such a lovely time eating and drinking and getting a little tipsy- which is probably the first time since conceiving Amazing M. I was giving her a bit of egg roll and getting a little excited with the fact she was taking it so well. How appropriate to have have her first egg experience on Easter Sunday. WRONG! When I put her in the buggy after our meal, I noticed that a redness had appeared all over the eye, cheek and nose area, as well as raised white bumps. I freaked and we promptly walked to the out of hours GP service. By the time we got there, the bumps and redness had pretty much disappeared which was not exactly helpful. After explaining the situation to the GP, he gave us the diagnosis of eczema. Hmmm. We are no doctors, but I am pretty sure eczema doesn’t cause the above symptoms. Anyhoo, Amazing M is ok, and I will have to give her some egg later on with caution to test our egg intolerance theory. Excitement over for the day. I love reading the Waitrose Kitchen Magazine. I go over the recipes and in my mind I picture myself making the gorgeous meals everyday only to realise I have a newly active baby, loads of laundry and other not so fun house work to do. 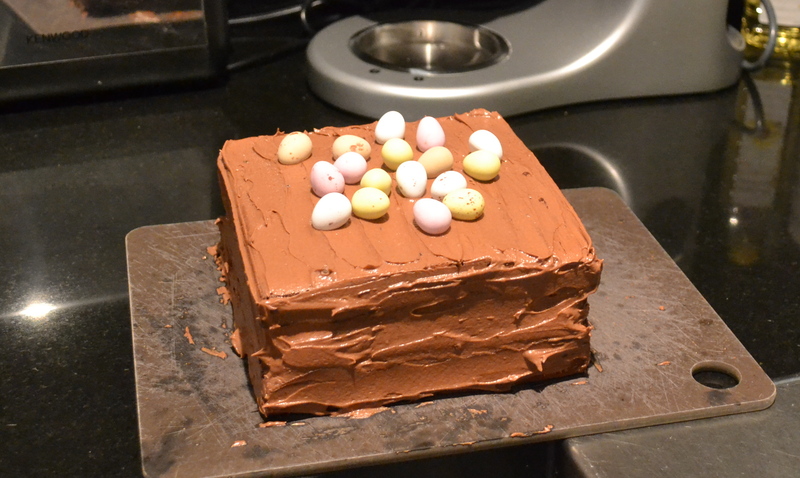 However, for weeks now I have put my intentions to making a chocolate Easter cake, inspired by a scrumptious looking Easter cake in the mag. Below is the result. A cake stand would have been nicer to present the cake- it’s next on my to-buy list. The icing looks a little off, as I didn’t level the cake as well as I could have, but I was quite pleased with my first attempt at a square cake. Better decorating next time!